Bioengineers have made an artificial jellyfish using silicone and muscle cells from a rat’s heart. The synthetic creature, dubbed a medusoid, looks like a flower with eight petals. When placed in an electric field, it pulses and swims exactly like its living counterpart. 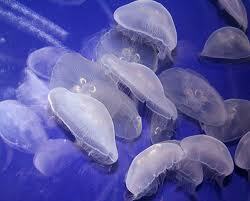 “Morphologically, we’ve built a jellyfish. Functionally, we’ve built a jellyfish. Genetically, this thing is a rat,” says Kit Parker, a biophysicist at Harvard University in Cambridge, Massachusetts, who led the work. The project is described today in Nature Biotechnology.